For the annual road race in Spokane, see Lilac Bloomsday Run. The English compound word Bloomsday is usually used in Irish as well, though some publications call it Lá Bloom. The first mention of such a celebration is to be found in a letter by Joyce to Miss Weaver of 27 June 1924, which refers to "a group of people who observe what they call Bloom's day – 16 June". On the 50th anniversary of the events in the novel, in 1954, John Ryan (artist, critic, publican and founder of Envoy magazine) and the novelist Brian O'Nolan organised what was to be a daylong pilgrimage along the Ulysses route. 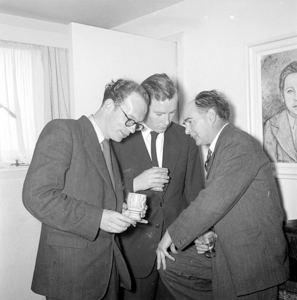 They were joined by Patrick Kavanagh, Anthony Cronin, Tom Joyce (a dentist who, as Joyce's cousin, represented the family interest) and AJ Leventhal (a lecturer in French at Trinity College, Dublin). Ryan had engaged two horse-drawn cabs, of the old-fashioned kind, in which in Ulysses Mr. Bloom and his friends drive to Paddy Dignam's funeral. The party were assigned roles from the novel. Cronin stood in for Stephen Dedalus, O’Nolan for his father Simon Dedalus, John Ryan for the journalist Martin Cunningham, and A.J. Leventhal, being Jewish, was recruited to fill (unknown to himself according to John Ryan) the role of Leopold Bloom. They planned to travel round the city through the day, starting at the Martello tower at Sandycove (where the novel begins), visiting in turn the scenes of the novel, ending at night in what had once been the brothel quarter of the city, the area which Joyce had called Nighttown. The pilgrimage was abandoned halfway through, when the weary pilgrims succumbed to inebriation and rancour at the Bailey pub in the city centre, which Ryan then owned, and at which in 1967 he installed the door to No. 7 Eccles Street (Leopold Bloom's front door), having rescued it from demolition. 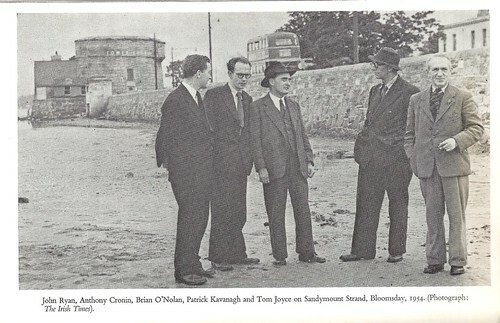 A Bloomsday record of 1954, informally filmed by John Ryan, follows this pilgrimage. The day involves a range of cultural activities, including Ulysses readings and dramatisations, pub crawls and other events, some of it hosted by the James Joyce Centre in North Great George's Street. 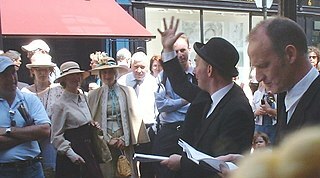 Enthusiasts often dress in Edwardian costume to celebrate Bloomsday, and retrace Bloom's route around Dublin via landmarks such as Davy Byrne's pub. Hard-core devotees have even been known to hold marathon readings of the entire novel, some lasting up to 36 hours. The James Joyce Tower and Museum at Sandycove, site of the opening chapter of Ulysses, hosts many free activities around Bloomsday including theatrical performances, musical events, tours of the iconic tower and readings from Joyce's masterpiece. "Every year hundreds of Dubliners dress as characters from the book ... as if to assert their willingness to become one with the text. It is quite impossible to imagine any other masterpiece of modernism having quite such an effect on the life of a city." On Bloomsday 1982, the centenary year of Joyce's birth, Irish state broadcaster RTÉ transmitted a continuous 30-hour dramatic performance of the entire text of Ulysses on radio. A five-month-long festival, ReJoyce Dublin 2004, took place in Dublin between 1 April and 31 August 2004. On the Sunday before the 100th "anniversary" of the fictional events described in the book, 10,000 people in Dublin were treated to a free, open-air, full Irish breakfast on O'Connell Street consisting of sausages, rashers, toast, beans, and black and white puddings. The 2006 Bloomsday festivities were cancelled, the day coinciding with the funeral of Charles Haughey. Bloomsday has also been celebrated since 1994 in the Hungarian town of Szombathely, the fictional birthplace of Leopold Bloom's father, Virág Rudolf, an emigrant Hungarian Jew. The event is usually centred on the Iseum – the remnants of an Isis temple there from Roman times – and the Blum-mansion, commemorated to Joyce since 1997, at 40–41 Fő street, which used to be the property of an actual Jewish family called Blum. Hungarian author László Najmányi in his 2007 novel, The Mystery of the Blum-mansion (A Blum-ház rejtélye) describes the results of his research on the connection between Joyce and the Blum family. Washington, D.C. – The Georgetown Neighborhood Library, located at 3260 R Street, NW, in Washington, D.C. held a marathon dramatic reading of Ulysses beginning 9 June and concluding on 16 June 2014 (Bloomsday). Twenty-five writers, actors, and scholars read Ulysses aloud in its entirety, a project which took more than 33 hours. The reading concluded with opera singer Laura Baxter performing Molly Bloom's soliloquy in its entirety, a feat taking 2 1/2 hours by itself. Philadelphia – The Rosenbach Museum & Library is home to Joyce's handwritten manuscript of Ulysses. The museum first celebrated Bloomsday in 1992, with readings by actors and scholars at the Border's Bookstore in Center City. The following 16 June, it began the tradition of closing the 2000-block of Delancey Street for a Bloomsday street festival. In addition to dozens of readers, often including Philadelphia's mayor, singers from the Academy of Vocal Arts perform songs that are integral to the novel's plot. Traditional Irish cuisine is provided by local Irish-themed pubs. In 2014, the Rosenbach's Bloomsday festival went on the road, with two hours of readings at the main branch of the Free Library of Philadelphia, an hour of readings at Rittenhouse Square, and concluded with five hours of readings on the steps of the museum, at 2008–10 Delancey Street. New York City has several events on Bloomsday including formal readings at Symphony Space and informal readings and music at the downtown Ulysses' Folk House pub. The Irish American Bar Association of New York celebrates Joyce's contribution to the First Amendment, with an annual keynote speech named after John Quinn, the Irish-American lawyer who defended Joyce's New York publishers in their obscenity trial in 1922. In 2014, New York celebrated Bloomsday with "Bloomsday on Broadway," which includes famous actors reading excerpts of the books, and commentators explaining the work between segments. The 2016 celebration includes a juried competition for the Best Dressed Molly and Leopold Bloom, selected from among attendees by a blue-ribbon panel including image strategist Margaret Molloy several design figures. Los Angeles, California-Each year Bloomsday is celebrated at the Hammer Museum with readings, music and libations. Kansas City, Missouri – the Irish Center of Kansas City currently hosts the Bloomsday celebration, started at Bloomsday Books, KCMO in 1995. Usually a day long event, the Center hosts readers of Ulysses, screens a documentary, and sponsors a play, punctuating the Joycean word with Irish dancers and a performance by Dublin balladeer Eddie Delahunt. This has been an annual event since its inception. Syracuse, New York – The Syracuse James Joyce Club holds an annual Bloomsday celebration at Johnston's BallyBay Pub, at which large portions of the book are either read aloud, or presented as dramatisations by costumed performers. The club awards scholarships and other prizes to students who have written essays on Joyce or fiction pertaining to his work. The city is home to Syracuse University, whose press has published or reprinted several volumes of Joyce studies. Detroit, Michigan – There was a marathon reading of Joyce's Ulysses on 15 June 2013, at Casey's Pub in the Historic Corktown neighbourhood. Los Angeles – The Hammer Museum hosts an annual Bloomsday celebration including: live Irish music, a Guinness happy hour, a public reading of the "Lestrygonians" episode, and a dramatic reading of "Sirens". Cleveland, Ohio – The Nighttown Restaurant/Jazz Club holds an annual read of the novel on Bloomsday as well performed by local enthusiasts. Wichita, Kansas – Bloomsday is honoured by a presentation on James Joyce (often by Dr. Marguerite Regan) as well as readings from Ulysses and Irish folk music, sponsored by the Wichita Irish Cultural Association. Norfolk, Virginia – The Irish American Society of Tidewater, Virginia, held a Bloomsday Happy Hour at Smartmouth Brewery, on Saturday, 14 June 2014. Live Irish music was provided by the band Glasgow Kiss, and IAS members attended dressed in Joycean accessories (fedoras, round glasses, eye patches, etc.). Portland, Maine – Readings from Ulysses at the Irish Heritage Center, corner of Gray and State Streets. Portland, Oregon - Powell's Books hosts a reading of the novel in its entirety for the duration of the day by authors, volunteers, and other Joyce lovers. Worcester, Massachusetts - long running annual celebration with readings from Ulysses at 7 sites around the city. Organized annually by the Worcester County Poetry Association. Tulsa, Oklahoma - The Oklahoma Center for the Humanities, Booksmart Tulsa, and the Guthrie Green hold an annual Bloomsday Pub Crawl in the Brady Arts District of downtown Tulsa. Each stop on the pub crawl is typically accompanied by live readings from or performances of selections from Ulysses. Phoenix, Arizona - the Irish Cultural Center and McClelland Library pull out all the stops to commemorate Ulysses, the famous novel of Irish author, James Joyce, during its Annual Bloomin’ Beerfest. The festival includes live Irish music, a costume contest – come dressed as your favorite character from the novel or from the time period - musical selections based on the novel in the library, and live readings from the groundbreaking and scandalous novel Ulysses. The beerfest typically showcases a great selection of Local Craft, Irish and Scottish Beers and a souvenir Bloomsday tasting cup. Since 2005 Bloomsday has been celebrated every year in Genoa, with a reading of Ulysses in Italian by volunteers (students, actors, teachers, scholars), starting at 0900 and finishing in the early hours of 17 June; the readings take place in 18 different places in the old town centre, one for each chapter of the novel, and these places are selected for their resemblance to the original settings. Thus for example chapter 1 is read in a medieval tower, chapter 2 in a classroom of the Faculty of Languages, chapter 3 in a bookshop on the waterfront, chapter 9 in the University Library, and chapter 12 ("Cyclops") in an old pub. The Genoa Bloomsday is organised by the Faculty of Languages and the International Genoa Poetry Festival. In Sydney, Bloomsday is hosted by the John Hume Institute for Global Irish Studies UNSW in association with the National Irish Association Sydney and the Consulate General of Ireland, Sydney. Bloomsday commenced in Auckland in the year 2000 with a radio transmission of Ulysses on Access Radio from midnight to 6 am, June 16 — the first Bloomsday celebration of the new millennium anywhere in the world. A cabaret show with Linn Lorkin and the Jews Brothers Band followed next year, 2001, and there has been a Jews Brothers Bloomsday ever since on June 16, with Brooklyn musician Hershal Herscher as a Woody Allen Bloom and Dublin actor Brian Keagan reading from Ulysses. Currently this three-hour show is hosted by the Thirsty Dog, on Karangahape Rd. Guest Molly Blooms have included top NZ performers Robyn Malcolm, Noelle McCarthy, Carmel McGlone, Lucy Lawless, Geraldine Brophy and Jennifer Ward-Lealand. A five-day Bloomsday festival has been celebrated in Montreal since 2012 with readings, academic workshops, films, concerts and musical galas, cabarets, walking tours of Irish Montreal, Irish pub events, and guest lectures by internationally known Ulysses experts. Major partners include the Concordia School for Canadian Irish Studies, McGill University Continuing Education, The Jewish Public Library, Westmount and Atwater Libraries. Bloomsday has been celebrated annually since 1993 in Prague, near the grove with a pond (an unrelated monolith was erected near the place several years ago) just below the Strahov Monastery. The Paris Bloomsday Group (five Paris-based Irish Joyceans) performs texts and songs from the work of James Joyce in such Parisian venues as the Irish Embassy, the Centre Culturel Irlandais or the American Library in Paris. Performances are in English with brief forays into French, Italian, Latin and Greek. In 2004, Vintage Publishers issued Yes I said yes I will yes: A Celebration of James Joyce, Ulysses, and 100 Years of Bloomsday. It is one of the few monographs that details the increasing popularity of Bloomsday.[who?] The book's title comes from the novel's famous last lines. Pat Conroy's 2009 novel South of Broad has numerous references to Bloomsday. Leopold Bloom King is the narrator. The book's first chapter describes the events of 16 June 1969 in Leo's story. In the novel by Enrique Vila-Matas Dublinesca (2010), part of the action takes place in Dublin for the Bloomsday. The book's main protagonist, Riba, a retired Spanish editor, moves to this city with several writer friends to officiate a "funeral" for the Gutenberg era. Punk band Minutemen have a song on their 1984 Double Nickels on the Dime album entitled "June 16th", which is named after Bloomsday. Richard Linklater alludes to Ulysses in two of his films. In 1991's Slacker, a character reads an excerpt from Ulysses after convincing his friends to dump a tent and a typewriter in a river as a response to a prior lover's infidelity. The film also takes place over a 24-hour period. In 1995's Before Sunrise, events take place on 16 June. A 2009 episode of the cartoon The Simpsons, "In the Name of the Grandfather", featured the family's trip to Dublin and Lisa's reference to Bloomsday. On Bloomsday 2014, it was announced that the chemist shop Swenys on Lombard Street, at which Bloom called to buy lotion for his wife, might soon close. ^ Louis Menand (2 July 2012). "Silence, exile, punning". The New Yorker. They walked to Ringsend, on the south bank of the Liffey, where (and here we can drop the Dante analogy) she put her hand inside his trousers and masturbated him. It was June 16, 1904, the day on which Joyce set “Ulysses.” When people celebrate Bloomsday, that is what they are celebrating. ^ Kiberd, Declan (16 June 2009). "Ulysses, modernism's most sociable masterpiece". Guardian.co.uk. Retrieved 28 June 2011. ^ Griffith, Sorcha (15 June 2006). "Charlie 'wouldn't have cancelled Bloomsday'". Irish Independent. Independent News & Media. Retrieved 15 June 2006. ^ Washington Post, Guide to the Lively Arts, 6 June 2014. ^ "The Rosenbach Manuscript of Ulysses FAQs". The Rosenbach Museum and Library. Archived from the original on 21 June 2011. Retrieved 28 June 2011. ^ "Bloomsday". The Rosenbach Museum and Library. Retrieved 28 June 2011. ^ Bloomsday Festival 2014 Archived 11 June 2014 at the Wayback Machine from the Rosenbach Museum & Library. ^ "Stream of Conviviality for Leopold Bloom's Day". NY Times. 10 June 2010. Retrieved 28 June 2011. ^ Getto, Erica. "James Joyce Fans: Here's How to Celebrate Bloomsday in New York". WNYC. Retrieved 20 May 2014. ^ The Paris Review. "Bloomsday Explained". Retrieved 9 November 2014. ^ "Events – DittoDitto". Dittoditto.org. Archived from the original on 10 August 2014. Retrieved 7 August 2014. ^ "Bloomsday 2012: 6/16/2012, 4:00pm at Artichoke Sandwich Bar in Wichita – The Wichita Eagle". Events.kansas.com. 16 June 2012. Archived from the original on 8 August 2014. Retrieved 7 August 2014. ^ "Joyce Museum Trieste". Archived from the original on 26 March 2012. Retrieved 28 June 2011. ^ "John Hume Institute of Global Irish Studies". Archived from the original on 9 August 2011. Retrieved 28 June 2011. ^ "Bloomsday". Archived from the original on 21 August 2011. Retrieved 28 June 2011. ^ "Melbourne Bloomsday". Retrieved 15 June 2012. ^ "James Joyce's Ulysses". Radio 4. bbc.co.uk. Retrieved 15 June 2012. ^ Dowell, Ben (31 May 2012). "Radio 4 to dramatise Ulysses". The Guardian. Retrieved 16 June 2012. ^ "Ulysses meets Twitter 2011". Retrieved 28 June 2011. ^ Tagholm, Roger (2001). Walking literary London : 25 original walks through London's literary heritage. New Holland. ISBN 1-85974-555-5. ^ Conroy, Pat (2010). South of Broad. Sydney: Allen & Unwin. ISBN 978-1-74237-361-4. ^ "mike watt talks w/michael t. fournier about "double nickels on the dime"". Hootpage.com. Archived from the original on 17 November 2014. Retrieved 18 June 2014. ^ O'Connell, Mark (16 June 2014). "Bloomsday 2014: Sweny's closing? Pharmacy that James Joyce's Ulysses made famous may not survive". Slate.com. Retrieved 7 August 2014. Wikimedia Commons has media related to Bloomsday.